This is the dramatic moment a sheriff's deputy pulled a man to safety after grabbing his legs when he tried to take his life by jumping over an overpass. 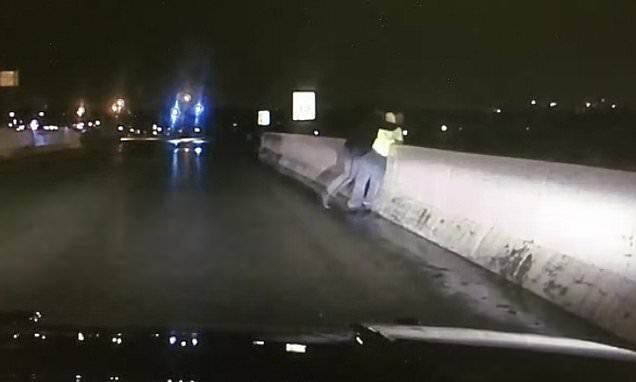 Deputy William Ball's dashcam captured the moment he saved the life of a suicidal man in Columbus, Ohio, on Sunday morning. He had been on a routine patrol in the vicinity of Georgesville Road and Interstate 270. Deputy Ball – who is trained in crisis intervention tactics - spotted a man looking over the wall of an overpass at around 6.20am. He quickly got out of his cruiser and approached the man, Franklin County Sheriff's Office said. In a post on Facebook, the sheriff's office said Deputy Ball tried get the man away from the wall by talking to him.